Age-related macular degeneration (AMD) is the leading cause of adult vision loss, the majority of which is due to choroidal neovascularization (CNV). With the increase in life expectancy, AMD management has become a public health priority. The pathogenesis of AMD is not fully understood and to date no cure or prevention exists. The treatment of choice for wet AMD involves repeated intravitreal injections of vascular endothelial growth factor (VEGF) inhibitors. However, this approach is only successful in a limited portion of the patient population and is not free of risks as VEGF fulfills important physiological functions in the retina and choroidal micro-vasculature. Therefore, more effective therapeutic and preventive measures are urgently needed. The main focus of my research is to find new therapeutic approaches to treat and prevent wet AMD, without the patient having to undergo repeated intra-ocular injections. 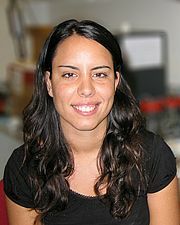 I dedicated 5 years of my research as a post doctoral fellow at Harvard Medical School in the laboratory of Professor A. Hafezi-Moghadam to investigate the molecular cause of the disease and establish novel treatment options. Now I am working at the University Hospitals of Geneva in the Department of Ophthalmology under supervision of Professor Farhad Hafezi, Chair of Ophthalmology, with the focus on translational research - bringing the science to the patient. Recently, our team showed a key role for an endogenous factor, the atrial natriuretic peptide (ANP), in the pathogenesis of AMD. 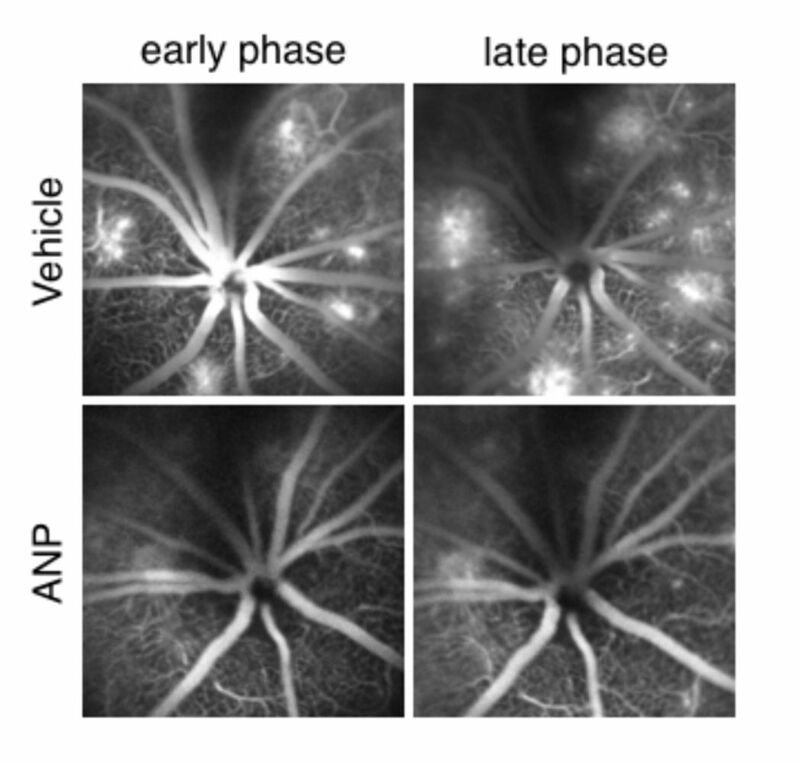 We found that ANP significantly reduces CNV (Figure 1) by countering the effect of VEGF on two retinal cell types, which form the inner and outer blood-retinal barrier (BRB) within the eye, retinal vascular endothelial and retinal pigment epithelial cells (RPE), respectively. The RPE produces ANP, however, the role of this molecule in ocular diseases was previously unknown. Figure 1: Representative micrographs of CNV lesions in the choroidal flat mounts from a control and ANP-treated animal. 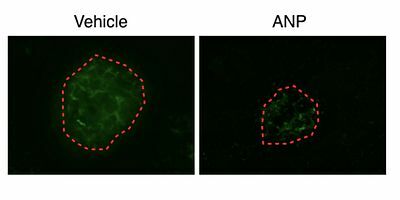 ANP’s anti-VEGF effects are unique, because it not only blocks VEGF-induced leakage (Figure 2) and angiogenesis, but it also reduces VEGF production. Since leakage and angiogenesis are key components of AMD, and ANP effectively reduces both of them, it is feasible that natural antagonists of VEGF, especially those that are endogenously produced in the eye, such as ANP, might in the future become viable options in the treatment of AMD. Figure 2: Representative fluorescein angiograms of animals treated with vehicle or ANP. A major burden of the current anti-VEGF treatment is that the inhibitors have to be regularly injected into the eye. It would mean a tremendous advancement, if the therapeutic agents could be given orally. Therefore, our team has been systematically studying the role of nutritional supplements with antioxidant properties. Among those we discovered the potent anti-inflammatory and anti-angiogenic effect of oil palm phenolics (OPP) in AMD pathogenesis. Our results indicate that specific components of OPP are efficacious in AMD and might pave the way to a non-invasive treatment of wet AMD. Ongoing work focuses on elucidating signaling events that take place during AMD. It is our goal to identify unique biomarkers of the disease and use state-of-the art imaging that was developed in our laboratory to diagnose AMD prior to its symptomatic stage.